Power Soak System: Labor Savings, Happy Employees, Cleaner Pots and Pans! I love to learn from people’s experiences and hearing fun success stories! At this year’s Texas Association for School Nutrition (TASN) Show, we had a Power Soak unit in our booth. The display Power Soak always generates interest, because the end of our Unit is Plexi-Glass and you can watch the pots and pans tumble. 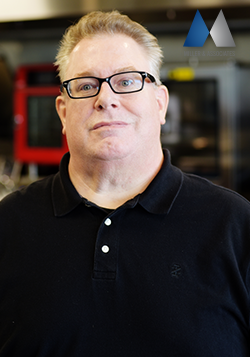 During the time set apart for Food Service Directors, I was with a customer and had just started to explain how the Power Soak unit works. A Director from another school district walked right up to the unit, looked at the first Director and said… “I have these in every one of my schools. It’s the best thing I’ve done.” I, of course was happy she had walked up. As I started to proceed explaining the function of the unit, the first director I had been talking to stopped me, and asked the second director, “really, WHY?”. Now, for more information on how the unit REALLY works, here’s some food for thought from the gentleman who invented the Power Soak! Continuous motion washing is defined as full submersion ware washing utilizing heated water, detergent and agitation without a fixed cycle time. One way of looking at a continuous motion commercial ware washing system would be to consider it an additional staff member that can be given tough washing/scrubbing tasks. Since the soils on pots and pans vary widely, there is typically no set cycle time. Rather, the employees assisting with pot and pan washing just need to come by when their schedule permits and remove, rinse and sanitize clean items. If an item is not 100% clean, the employee can either quickly finish it off with minimal effort or simply drop it back in and get it on the next stop. This is why one of the training messages is “You just need to get the pots and pans to it and through it. It will do the tough scrubbing and washing work.” This being said, some of the newer systems on the market incorporate “batch washing” processes and alert systems. 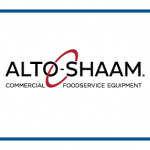 These are typically used in commercial foodservice operations where pot and pan washing is a “shared function.” The batch washing alert system lets any employee or manager know when the items in the system should all be 100% clean and ready to rinse and sanitize. Revisiting the definition above, heated water and detergents are givens, but the agitation is where the commercial ware washing systems on the market gets set apart. This is where the “Three R’s” of continuous motion ware washing come in – Rotate, Reposition and Represent. Items must be rotated and kept moving freely in the system to get clean. To optimize washing, ware items must naturally and freely reposition as they rotate in the system. Finally, ware items must consistently and repeatedly represent in front of the wash jets to effectively strip away loose soils. It is critical to remember that in a continuous motion washing application, the loose (un-racked) ware items must be rotated through the stationary wash jets. This is the exact opposite of spray washing where rotating wash jets are moved through stationary (racked) ware items. Many pot washer systems try to rotate mostly square or rectangular ware items in a circle in a rectangular tank. With longer distances for the wash water to travel and gravity working against them, ware items tend to pile up or “log-jam” in the system, and can cover and restrict the pump intake and not get properly washed. 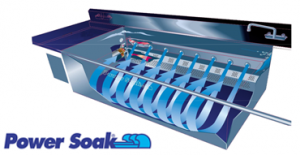 Look for systems that rotate the ware items vertically from an end view of the wash tank, like the Power Soak system. These systems lift the ware items up towards the front of the tank, and then the current carries them towards the rear of the tank where gravity drops them back through the wash jets. Ware items continuously rotate, reposition and represent so washing is even and fast. In addition, these ware washing systems outshine other systems from a standpoint of ergonomics and gentle washing. On these last two notes, there is much more to discuss and consider. We will continue to cover key facets of continuous motion washing in the next Power Soak blog. 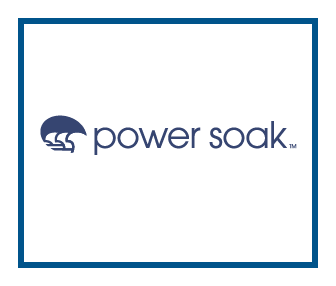 Or visit our website <www.powersoak.com to learn more now!